While you’re guaranteed to have a great time on both of our zipline tours, our Mountaintop Zipline Tour takes your experience to a whole new level. You’ll soar high above the mountaintop with higher vantage points and longer lines than ever before. This tour includes 6 dual lines that allow you to share the experience with the person of your choice by your side. You’ll have panoramic mountain views that you can’t get anywhere else. Not only are there ziplines, but you’ll also experience an ATV ride up the mountainside, cross 4 sky bridges, and end your adventure by rappelling from the final platform. It’s an experience you’ll never forget. Another way to make your Smoky Mountain zipline adventure more enjoyable is to include more than one fun activity! With our adventure packages, you can combine 2 or 3 activities for the ultimate experience in the Smokies. Activities you can choose from include our Treetop Canopy Tour, our Mountaintop Zipline Tour, mountain biking with us, or white water rafting with Smoky Mountain Outdoors! Smoky Mountain Outdoors offers an exciting and safe way for you to coast down the Pigeon River. All of their trips are fun for first-timers, and an experienced guide accompanies you on each trip to guarantee you have a great time. We recommend choosing both our zipline tour, our mountain biking adventure, and a rafting trip for the ultimate experience! When you visit the Smokies for your zipline tour, you’re going to need a place to stay! To make your experience even better, you can stay in a beautiful tiny home. Members of our CLIMB Works family, Brian and Trish Turley, have created a serene Swiss mountain village that lets you enjoy your time in the Smoky Mountains in a unique way. Long Springs Tiny Homes has 16 tiny homes that are located in a secluded wooded community not far from Gatlinburg. Each tiny home includes high, vaulted ceilings that make them feel spacious, and amenities like a microwave, refrigerator, cable TV, and WiFi. This tiny home community also has a common area with a fire pit, play set, corn hole, hammocks, and a picnic area. 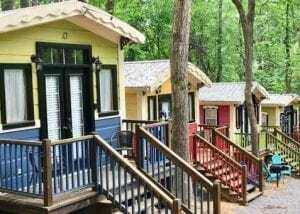 A stay in one of these Smoky Mountain tiny homes is just what you need to complete your one-of-a-kind zipline adventure! 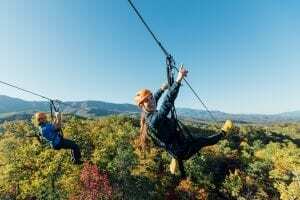 Now that you know the best ways to enjoy your Smoky Mountain zipline adventure, it’s time to start planning your trip! Book your zipline tour today!